The things to caution about mushrooms are the toxic compounds that they contain; namely hydrazine and agaritine. Hydrazine especially is hepatotoxic (see here), so you never want to eat mushrooms raw or undercooked, especially not in such quantities. Cooking mushrooms very well (for 1-3 hours) removes virtually all of the hydrazine and most of the agaritine. 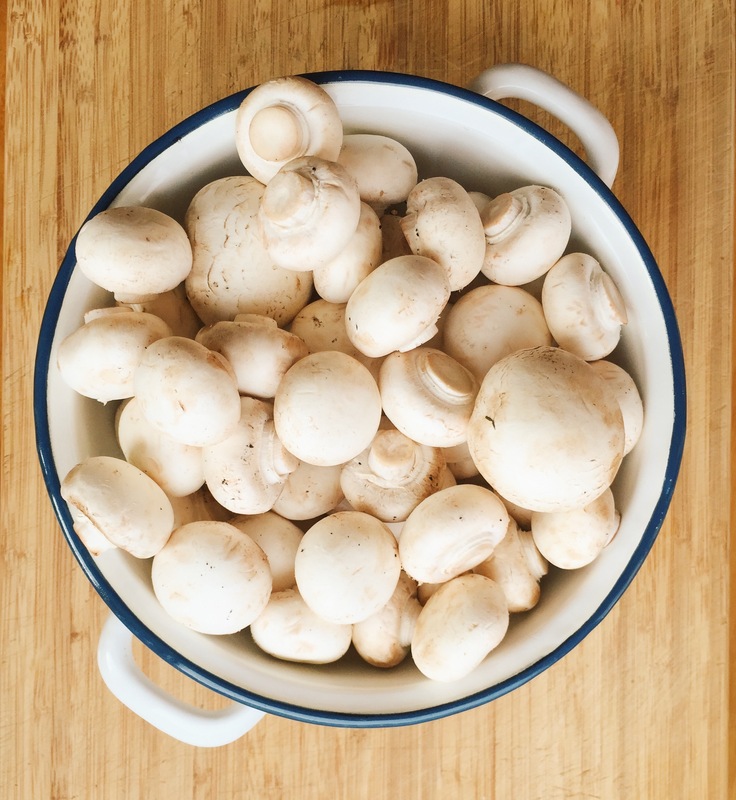 Listen to Ray Peat on KMUD here discussing white button mushrooms, Chinese study, containing aromatase inhibitors – women who had at least 10g a day on average, 88% lower incidence of cancer mortality. I cook up no less than 1kg of white button mushrooms at a time to make the effort worthwhile. Throw into a sink full of water and give them a rub to remove any dirt. Drain in a colander. Get out your blender or food processor (or if you don’t have one, start chopping). A lot of my clients report that they have better effects from mushrooms when they’re completely ground up, otherwise slice them finely with a food processor or knife. If you’re blending them into oblivion, pop them in your blender with half to 1 liter of water (depending on the capacity of your blender). Blend til it becomes brown mush then pour into a heavy based pot. If sliced, put into a big enough pot and cover with water (filling it no higher than an inch from the rim). Bring to a boil, then keep at medium-high heat. Turn your range hood exhaust fan on and leave it on (to whisk away the hydrazine that’s released in the steam). Boil uncovered for at least 1, or up to 3 hours. I cook mine for at least 2. Check the water level every now and then and top up if necessary so they don’t dry up and burn. If there’s some residual ‘broth’, keep this, or cook until most of the water is gone, but they’re still wet. Just don’t let them dry up, brown or burn. For storage, allow to cool off then keep in an airtight container in the fridge for up to 5 days. If your batch is more than you’ll get through in 5 days, portion it and freeze. For best results, you want to have these at least twice a week, or as much as daily. Having them right before bed can maximise their antihistamine action. This is a great way to get in a lot in one go. 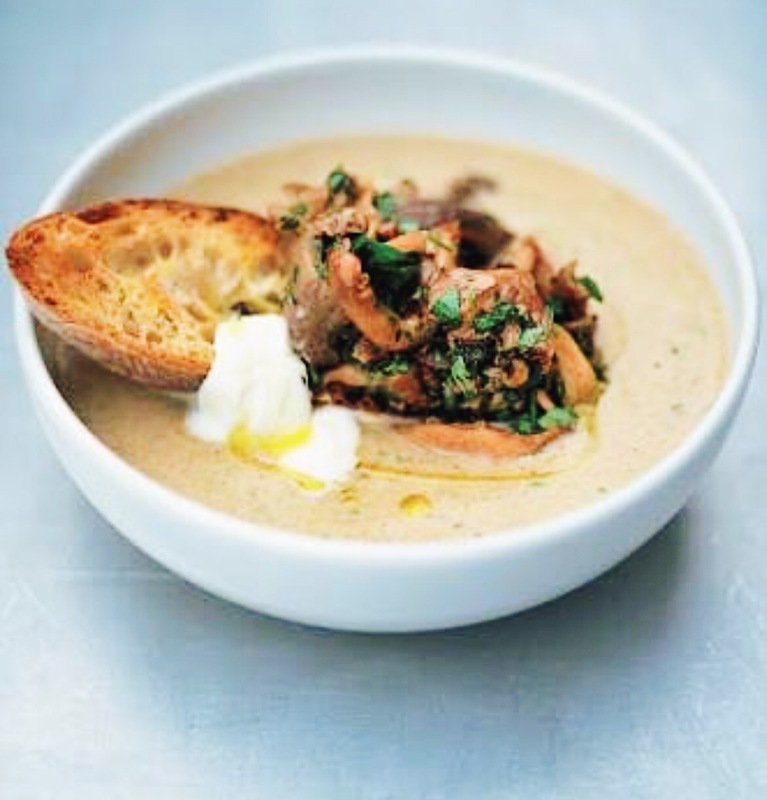 Although you could just eat a bowl of blended and cooked mushroom mush, I personally don’t find that appetising (and food should be delicious, otherwise why bother?!) But when I’ve flavoured the mushrooms up like this, I can’t get enough. Blend the mushrooms and water in a high powered blender (in 2 batches if necessary). Pour into a heavy based pot, bring to the boil then reduce heat to about medium (turn your range hood fan on). After at least an hour (stirring occasionally) add 500ml broth. Bring back to the boil and then simmer for another 30 minutes to 1 hour. Add more liquid if it gets too thick for your liking. Heat coconut oil in a frying pan, add the onion, garlic and a sprinkle of salt. Sauté until softened, add the herbs. Tip all of this into the pot. Add the lemon zest and juice, mascarpone, pepper and a tsp of salt. Stir over low heat for a couple more minutes. Check seasoning and add more salt to taste. Ladle into bowls and garnish with another dollop of mascarpone. Nice with buttered sourdough toast if that’s your thing. pure gold! thanks for everything you do Emma! Your advice and that of Ray’s is life changing. Emma – do you think you could use the prepared cooked mushroom as the meat sub in a bolognase like sauce or a taco type sauce? or would it be too runny/wet? Yes might be a bit messy Renaee. I think for dishes like these when you’re using mushrooms as a substitute for meat, maybe rather than blending them up, slice or dice them instead. Then cook them … At least that way it’ll retain some of the meatiness and it won’t be so sloppy! Thank you for sharing your brilliance Emma, these are so good! Do you bother removing the stalks? Kate you’re too kind! Only if the ends are really dry or woody, I’ll trim the ends of the stalks off. Would you also apply the same cooking time to other varieties of mushrooms, shiitake for example? Thanks Emma! Thanks Emma, this is great info. Do you think pressure cooking the mushrooms in about half the time would be as effective? Ana unfortunately not. They need to be boiled uncovered so the hydrazine can evaporate off fully. Would having a serving of mushrooms and a carrot salad each day be overkill? depends on how much help your bowels need. Some people don’t feel the effects of say carrot salad until they have it twice a day, so in that case, both mushrooms and carrots daily could be a great thing. Or alternate them … Experiment and see! I contacted Ray regarding the need to put a lid on the pot when cooking mushrooms. He said the hydrazine is mostly destroyed by heat and so it does not matter whether or not you use a lid on the pot. Being able to use a lid means you will use a lot less heat and won’t need to have the extractor fan going for 3 hours. That’s good to know David, thank you. He must’ve relaxed his thoughts on this; he advised me to keep the fan going to whisk away the residual airborne hydrazine. I’ll keep my fan on regardless so my living area doesn’t stink up of mushrooms!